Last night Seven dominated viewing, leading across all slots, thanks to the My Kitchen Rules finale. The Grand Final pulled 1.37m viewers, down slightly on 2017’s 1.39m, but the Winner Announced grew to 1.54m, which was up on last year’s 1.48m. The finale topped all demos with the biggest audience in Sydney, not Melbourne. The good news for Nine was The Voice barely wavered, pulling 1.02m viewers and almost replicating last Sunday’s 1.06m. 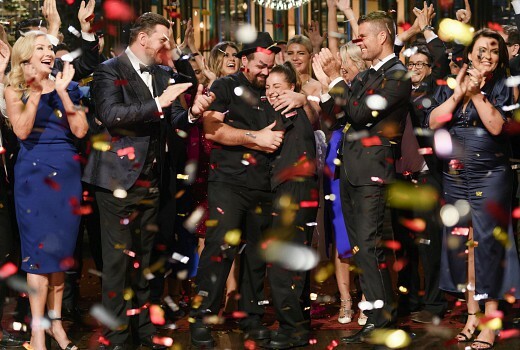 ABC’s Absolutely Champers special managed third place with 511,000. Against such competition it was a tough night for TEN, with an All Star Family Feud special on an all-time low of just 160,000 -in last place behind SBS. While 60 Minutes at 707,000 was ahead of Sunday Night, the two shows were practically in different timeslots. Seven won Sunday with 38.8% then Nine 30.9%, ABC 14.4%, TEN 10.5% and SBS 5.4%. Outside of MKR, Seven News was 1.14m, Sunday Night was 683,000 in preliminary numbers and An Hour to Catch a Killer 342,000. Nine News (1.06m) was best for Nine then The Voice (1.02m), 60 Minutes (707,000) and Murdered by my Daughter (305,000). ABC News (636,000), Joanna & Jennifer: Absolutely Champers (511,000), Midsomer Murders (344,000) and a repeat of Julia Zemiro’s Home Delivery (196,000) comprised ABC’s night. The Sunday Project (343,000 / 217,000) followed by TEN Eyewitness News (281,000), NCIS (251,000), Family Feud (197,000), All Star Family Feud (160,000) and SEAL Team (143,000). On SBS it was The Celts (190,000), SBS World News (160,000), After Hitler (132,000) and Red Obsession (111,000). Thomas and Friends on ABC KIDS topped multichannels with 193,000. Poor night for SBS as well-nothing over 200,000 (which the 7.30 arch/hist doc usually manages) and the post WW2 doc started at 5.30pm=is that primetime now? No surprises with Seven winning the night. A disappointing night for Ten. The numbers for the All-Stars Family Feud is too low for anyone! I had hoped that more had tuned in for the first run of Red Obsession on SBS. Its a great doco, which did win Best AACTA Documentary a few years back. Started watching my first MKR of the year but it was too much like Masterchef. Switched to The Voice: after umpteen years they are doing well to have viewers. Seven are warning that the New House rules which features no contestants just one snarky judge is coming. Heaven forbid they use the same footy commentator voiceover guy from MKR. Wow, your Family Feud exclusive stacks up even more now after seeing that! And that was a prime time special!! No mention of what they actually cooked. Anyone would think it doesn’t matter. Tee hee. Why would I write it in a ratings post when I already put it in one on the winners? Yes, so hard to miss the post below.